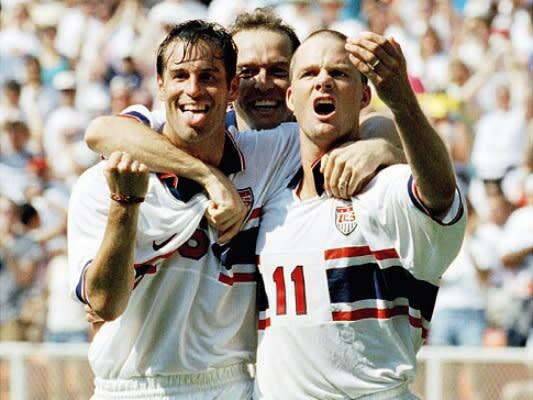 COMPLEX SAYS: Prior to last year's World Cup, former U.S. soccer coach Steve Sampson revealed that he released John Harkes (pictured left) from the '98 U.S. team because Harkes was sleeping with Amy Wynalda, the wife of his teammate Eric Wynalda (pictured right). The 1998 U.S. team finished in last place of the 32 teams competing in that year's World Cup (surprising, huh?). In regards to Sampson's revelation, Harkes said, "I am not going to rehash the things that have happened in the past...1998 was devastating to me and my family." After peeping the pic above all we can say is: Unless it's MJ, never trust a dude who sticks his tongue out.